Euro area labour productivity is currently low, despite massive uplift in unemployment (which should have increased output per employee more substantially). Euro area labour productivity has grown faster than that in the U.S. in the period of 1986-1995, but has been growing at a slower rate for some twenty years now. 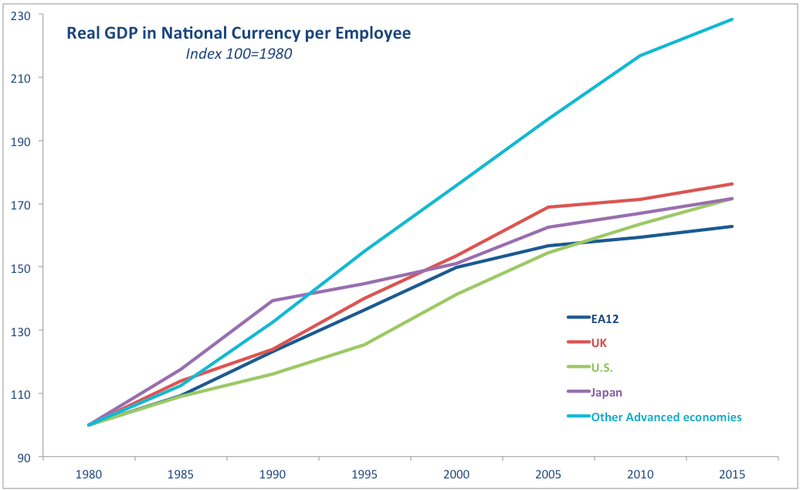 Post-2010, euro area productivity has been lagging all groups of advanced economies. 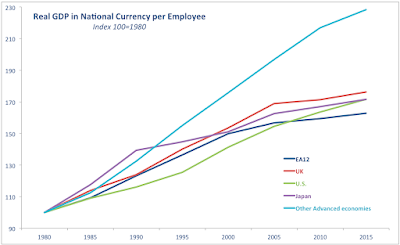 Now, remember, no one talks as much about carrying out labour markets reforms as euro area leadership. In a way, this might be warranted, given poor performance, but in a way it also might suggest that the reforms are not working. After all, since the start of the Great Recession, allegedly, we had plenty of these reforms, and we had a 'productivity-enhancing' rise in unemployment, reduction in labour force and wages moderations galore. And productivity is not really expanding much. Secular stagnation, anyone?